I figured since I'd spent the majority of this month going on about my health kick and healthy eating this, exercising that, that it was time for a naughty treat. Seeing as it's the end of the month and payday (can't forget that!) I'd show you one of my favourite treats to make in my Morphy Richards Easy Blend blender. 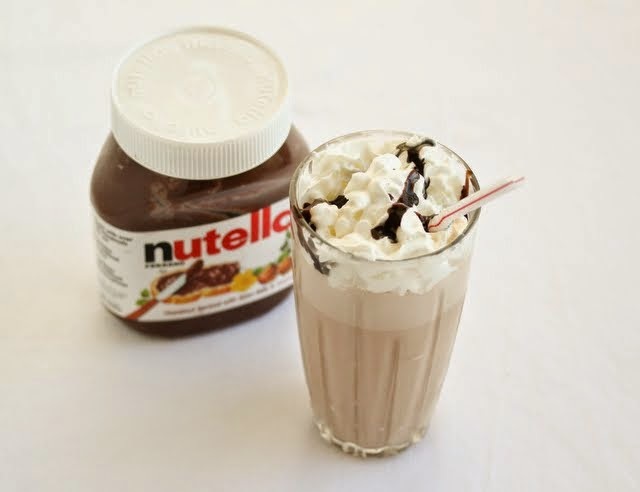 They are super easy to make and all you need is Nutella, bananas and milk. I like to use almond milk. I throw in 2 bananas, 2 tablespoons of nutella and a cup of milk into the blender and wizz it up for about 1-2 minutes. You could then add some squirty cream and chocolate syrup on top to finish. Then you're done and they are sooooo yummy! You could swap the milk for cream or ice cream if you wanted something a bit naughtier OR if you still wanted to try and stay healthy you can swap the nutella for hazelnuts and chia seeds. However, you will want to soak the hazelnuts in water or half water/half milk to soften them first else they won't blend properly and could damage your blender. I hope you enjoy this recipe as much as I do. What else can I blend? If you have any good recipes, let me know! Instagram | Twitter | YouTube - check out my May favourites video here!